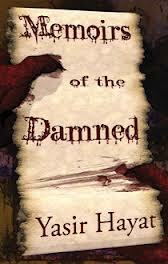 Memoirs of the Damned is a tale of vampiric revenge from writer Yasir Hayat. In the opening chapter we are introduced to the character of Andross Ameliyo, a man orphaned from birth and sent to work in slavery at the workhouse as a child. Rescued from his fate, Andross lives a life of contentment which ends all too suddenly at the death of his wife. Filled with grief and alcohol, Andross is accosted in the night only to be given a choice between life and death by the mysterious Sereigravo. The above all happens in the first few pages, the focus of the story being Androssâ€™ transformation from vampire protÃ©gÃ© to vampire lord and beyond. Abandoning his human name, he becomes Crimson and is tutored by Sereigravo before several truths are revealed to him, leading to a quest for revenge. The story itself is an interesting look at vampiric legend and hierarchies, trying to give a new twist on an oft visited genre whilst weaving in creatures from myth and legend; banshees, demons and the like. Hayat takes the opportunity to delve into areas of moral ambiguity and explores the effect of conflicting emotions within Crimson/Andross. These conflicts are the driving force behind Memoirs of the Damned and take our protagonist on a journey of retribution and discovery. The writing style is purposefully slightly antiquated, reminiscent of the Brothers Grimm, or tales of that era, and is suited perfectly for this type of story. Unfortunately, similar to the Brothers Grimm, Memoirs of the Damned skips chunks of essential narrative to move us from one act to the next. As a reader, this left me with a feeling of frustration as characters cropped up at convenient points rather than there being any build up, leading to me re-read passages to see if I had missed something; I hadnâ€™t. You get the sense that Memoirs of the Damned was written as a collection of short stories and concepts woven together rather than as a single novel from the outset. Â And there are some good standalone stories within the piece coupled with well written and absorbing fight scenes, at one point Crimson storms a castle singlehandedly, but overall there is not enough quality to overcome the feeling of disjointedness. If you are a fan of myths and folktales then this might be one for you; however, if youâ€™re after a more engaging tale of vampires then there are better books out there at the moment.